Who does President Trump think will be his 2020 opponent? Axios reported on Wednesday that Trump ‘“talks the most”’ about facing Sen. Elizabeth Warren and “’seems to think she’s going to be the nominee.’"
In ancient pre-Trump political times, December 2014 to be exact, I penned a piece on a conservative site entitled Clinton/Warren 2016. 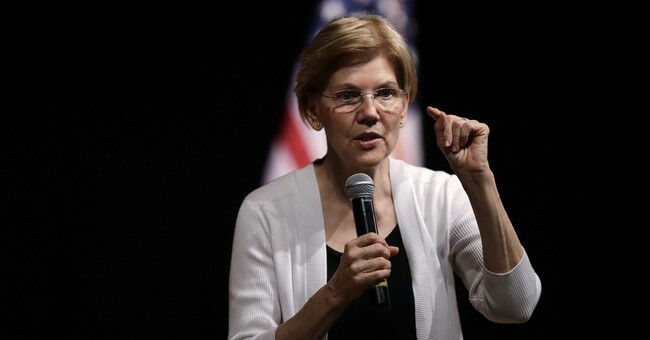 It was prompted by Massachusetts Sen. Elizabeth Warren’s growing stature in the Democratic Party as a fighter “‘for the people.’” I opined that Warren’s increasing influence and grassroots popularity with her then-“fresh faced” and “rising star” credentials propelled her — as a yet-undeclared presidential candidate — to push lackluster and presumed 2016 presidential candidate Hillary Clinton further to the left. Warren’s leftward momentum was good news for the GOP’s 2016 chances of winning the White House. That helps explain why CNN has Warren at the top of the ever-expanding list of Democratic 2020 wannabees with, as noted above, California Sen. Kamala Harris in second place. But, unlike in 2014 when Hillary Clinton was clearly number one, 2020 could portend a vicious fight between Harris and Warren who, at this juncture are equally likely to win the nomination. By every new and traditional political metric, both women appear to be actively seeking the 2020 nomination. It is also safe to assume that the Democratic ticket will include at least one woman and I will argue possibly two, depending on the size and strength of a “pink wave” in the midterm elections. Close to four years after C-SPAN’s Washington Journal displayed and read aloud from my Clinton/Warren 2014 piece, (almost as quaint political entertainment) the prospects of an all-female ticket do not appear to be the least bit radical or unlikely. Honestly, even referring to a 2020 female ticket as an “all chick tick” as I did in 2014 sounds dated! Republicans cannot downplay the long-term policy impact of how women are on an accelerated path to dominating and controlling all aspects of the Democrat Party. The progress is astounding even compared to 2016 when Hillary Clinton won women by a margin of 52 to 41 percent over Donald Trump. Conversely, Trump won white women by a 57 to 37 percent margin. Worse news for the GOP, women of color, who overwhelmingly vote Democratic along with younger women in general, are growing demographically and showing up to vote in greater numbers while increasing their political activism. Then, combined with white suburban women — who GOP strategists feared (even before the Kavanaugh matter) might help deliver Congress into Democratic hands come November— could also contribute to the creation of a “pink tsunami” resulting in a historical all-female 2020 ticket. “No” to laugh, “yes” to fear, and “heck no” to dismiss. But after the results of the midterm election, I reserve the right to a more definitive answer.